You probably already know that maintaining a healthy body weight is an important key to your health. In fact, over 45 million of us diet every year. And yet, two-thirds of us are still overweight. Obviously, something is missing. 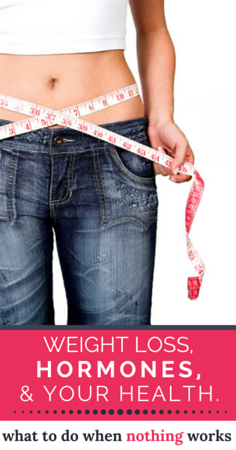 You want to lose weight, but it just isn’t happening. Perhaps your battle with the bulge began when you were a child. Not only do we inherit defunct genes from our parents, but we also pick up their bad habits. Often, parents unknowingly teach their children that it’s okay to stress eat, that you must enjoy a fatty snack when watching television, or that cheap junk foods are an acceptable substitute for whole, organic, nutrient-rich fruits and vegetables. However, now you’re an adult, and you can’t continue to blame your parents for your current lot in life. No, it’s time to take responsibility and change those bad habits into good ones. It’s entirely possible to do so with a little education on proper nutrition. What if you’ve already been educated on proper nutrition, and yet you still can’t drop those pounds? Is it time to throw in the towel and assume it’s your genetically predestined lot in life to be overweight? Absolutely not! You can put all of the premium gas in your car that you want, but if your brakes are on, you’re not going to go anywhere. The same is true for your body. Even if you eat healthy foods, if your body is slowing its metabolism to a halt, you’re not going to get far on your journey of weight loss. How do you know where the problem lies? The good news is that, because this is such a common problem, there is often a common solution. In fact, there are a handful of hormones that, if gone awry, are likely the cause of your inability to lose weight. All of these hormones can be measured to find out if they are within normal limits. Some of them, like cortisol, you are probably already familiar with. However, have you ever heard of leptin? This important hormone could be the very thing preventing you from looking and feeling your best! Other hormones have also been shown to slow metabolism to hibernation levels. Want to know more? In our latest eBook, Weight Loss, Hormones, and Your Health, we explore five different hormones and why they may be preventing you from losing weight. In addition, you’ll find out how to start the process of returning your hormone levels to normal. Imagine fitting into your favorite skinny jeans just months from now! Download your free copy of the eBook today, and see how to turn a little education into real results! We hope you enjoy it in good health!